Your property can’t be left without working drain lines. When a commercial property has backed up drains, often that property has to close down for business, and when that happens that company is not able to produce an income and could be losing clients in the process. At Robins Plumbing, Inc we can handle all of your commercial drain issues and will make your company a top priority. Whether your a restaurant with a backed up floor drain or a condominium complex with hundreds of units backed up, we can handle your drain issue with expedited service and get your back up and running again. Properly maintaining your commercial lines over time is also incredibly important to assist with sludge and grease that build up in lines over time. This is a recipe for disaster. High pressured jetting can clean the walls of your pipe allowing them to perform like new again, helping to ensure that you don’t have an emergency stoppage due to build up inside your drain lines. 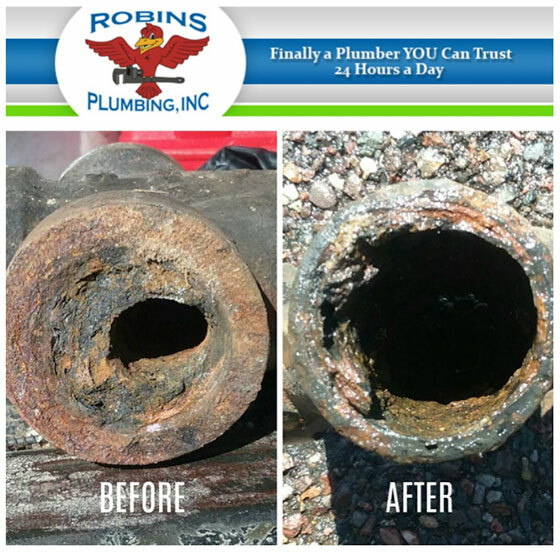 Call Robins Plumbing, Inc. today to schedule your commercial jetting services. Robins Plumbing, Inc in Phoenix specializes in commercial and residential jetting services. If your drains are backed up, it’s important to call a professional plumbing company right away to inspect the issue. In addition to our jetting services, we also offer a variety of plumbing services to residents and business owners. We offer drain cleaning, backflow prevention, faucet repair and replacement, water treatment, slab leak locating and repair, and more. We also offer a loyalty program to pass on amazing savings and benefits with our loyal customers. If you have any questions about our Phoenix plumbing company or you would like to learn more about our plumbing services, contact our team today.